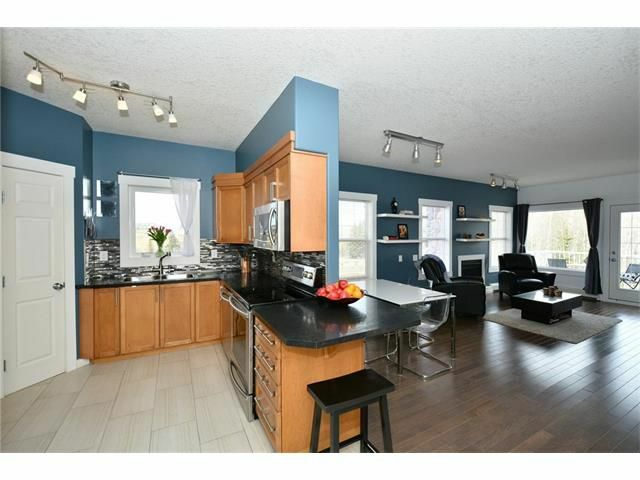 Completely reno'd and modernized TOP FLOOR corner unit in Cochrane's upscale Sunterra Ridge Estates. You'll be wowed as soon as you open the door - floor to ceiling upgrades for today's buyer. Located in a quiet corner of the building, with easy elevator access to the underground parkade. Lots of large, bright windows, to bring in the views. Gourmet kitchen, lots of cabinet space, large pantry, and ss appliances. Cozy up in front of the fireplace or step onto private balcony with ntl gas hook up for a BBQ. In-suite laundry with full size washer/dryer and more storage space. Sunterra is ideally located, within walking distance to schools grades 1-12, Cochrane Ranche Park, walking trails, and a 2 minute drive to downtown Cochrane. This unit includes 1 titled underground parking stall, underground storage cage & 1 assigned above ground stall. Come and view this great property today - you'll be glad you did!